Chris: One month on our therapy, how do you feel? Patient: My appetite had improved – I can eat a lot more. Then after food, I do not feel any more pressure in my stomach. I do not feel distended anymore. But my abdomen is still big. C: Last month, you said you were tired? P: Now I have more energy. C: (Looking back at the medical records) Oh, you were asked to go for chemo? P: Yes, go for operation and then chemo. Wife: No, we did not want that. We don’t want. C: It means nothing is removed from your abdomen? W: No, nothing was removed. P: The only thing I did was the biopsy (done twice in Singapore). C: Okay, no operation, no chemo. And you are already one month on our therapy, does the therapy help you? It is important to know this. P: Yes, it helped me. Before, whether I ate or not, I always feel tightness (or pressure) in my abdomen. Now, there is no more pressure. C: Is your life better now? P: Of course. I feel fit (patient laughed loudly. Wife also laughed. This is a stark contrast last month on their first visit. The mood was sober! No laughter). C: Now, are you happy with what you are doing or do you want to go and see the doctors and let them operate and chemo you? P: No, no I don’t want that. (Wife laughed loudly). C: If you don’t want to operate and don’t want chemo, what else can we do? P: Before, I ate anything I liked. But now, I am on a strict diet. W: Now, it’s a bit difficult. He is now confined to vegetables! C: Okay, if you want to eat anything you like, you die faster! That’s all I can say. You die faster! If patients want to die faster, go ahead and eat a lot of what they like! C: This is what you need to know. By doing what we teach you, you see it helped you. You are alive and you feel good. If you go for the operation and chemo, you may remain alive but you may suffer – do you want that? What is the point of being alive and then suffer. P: No, no (shook head). C: But when you come here, you want to get well but at the same time you want to eat anything you like – that is not possible. Chris: After taking the herbs, how are you now? P: I feel stronger. I have more energy. I have gone to check my blood. The CEA had gone down. C: Ah, today it goes down and you are happy. Tomorrow it goes up and you cry! Don’t worry too much about that. Okay, it is good that it goes down. But what about your appetite now? P: Good but the menu is not suitable! C: Ho, ho, it is the food now! What do you want to eat? Pork? If you start to eat pork you die! (Wife – laughter) You are indeed very lucky. Before you came here, you stomach was bloated. How is it now? Wife: It has not gone bigger. C: The CEA had decreased. The CA 19.9 had also decreased. I am not sure what can happen if you start to take the bak-kut-tea here. Please don’t do that. Okay, you are doing well. Please don’t fool around. Very good. I am very happy. (Note: Lam stayed on in Penang a week and underwent the e-Therapy. This is provided free-of-charge to our patients who we think could benefit from the e-therapy). C: You have been on our therapy for about 8 months now. Does your condition get worse or is it better? P: No, it has not deteriorated. C: Not deteriorated. Good enough – don’t ask for more. Tell me again, do you feel you have more difficulties? C: Do you feel better? C: If you feel better, good enough. What else can we expect? From what I can see, your conditions, compare it with the day you first came here and now, you seemed to be better. 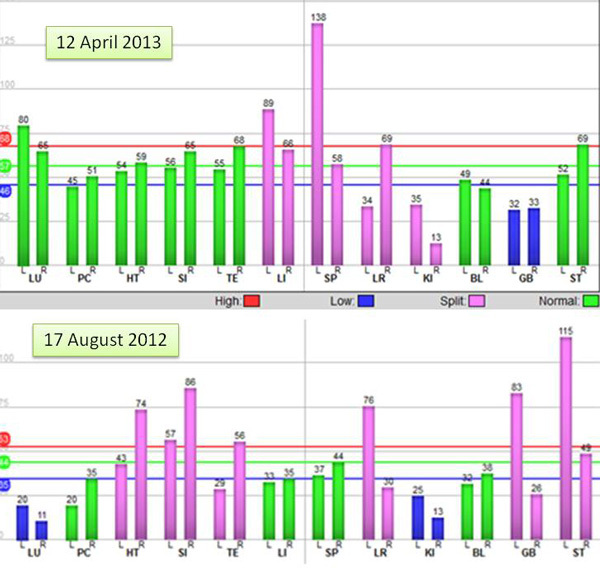 Note: The AcuGraph on 12 April 2013 (top) showed higher energy and well-balanced qi in most meridians (green bars) compared to 8 months ago, 17 August 2012 (bottom). P: At home, I need to move around then I feel more energetic. C: You were asked to go for operation and chemotherapy. You did not do all these? C: Under such situation, where you did nothing and that you have not deteriorated, it is very good indeed. And we must sustain that. P: Recently I went for a blood test again, but we forget to bring the results. The CEA had decreased further. It is now at 5, before it was 7.5. The CA 19.9 had also decreased. The first time it was 43.3 and now it has gone down to 22.0. C: I did not expect that. This shows that your conditions are not getting worse. Whatever it is, it is important to ask yourself. How do you feel? Do you feel better as a person? Compare this to the first time you came here – do you feel you are better or you are getting worse? P: No, no. I am not getting worse at all. P: Yes, appetite-wise I can eat a lot. C: Before you felt your stomach was bloated? P: Yes, but now I don’t feel bloated anymore. Before, after eating even very little, I felt full. Now I am okay. C: I really don’t know what else to say. If you asked me before what to expect, I would say, I give up! P: Since the last 2 months, I felt muscle strain in my neck and shoulder. When I took painkiller, the problem went away. Then it came back again. C: When are you going home? The famous Singapore oncologist wrote: In oncology, even prolonging a patient’s life for three months to a year is considered an achievement. Achieving a cure is like striking a jackpot. All cancer patients should know this. Better still if they are told this by their doctors before they undergo chemotherapy. This makes the game fair. In fact, I found this statement very inspiring indeed. And it has become the gold standard or yardstick by which I measure the outcome of our work at CA Care. If patients who come to CA Care can live a happy life for an additional 3 to 12 months, it would be just GREAT. As I have told Lam, please don’t ask for more. Let us forget about trying to strike a jackpot! Cure for cancer is elusive. To me, I don’t see any cure at all. But let us try to prolong life, free of pains and side effects. And also free from excessive financial burden. Perhaps this would be a much better option and is much preferred than the toxic medical treatment? You be the judge. It is your life. Of course, some people would be upset and unhappy. To be able to give 3 months to a year is not enough. That is not what they want. They want more! I am reminded of an e-mail I received some days ago. This is a patient who had failed to find a cure for his lung cancer. He had gone through 7 months of chemotherapy but the tumour was getting bigger instead of smaller. The oncologist suggested more chemo but he refused. The wife asked if there is a chance for him to proceed with our treatment. He is going to be 70 years old and he desires to live till 80 and more. Okay, I understand – everyone wants to live forever if they can. But what can anybody do to help? This was my reply: Since I am not god and I also don’t want to play god, I really don’t know what I can do to make you live longer. I can just try my best. Perhaps, cancer patients can learn from other people’s cancer experience. Dr. Albert Lim was Malaysia’s best known oncologist. He had prostate cancer. Generally when patients come to CA Care with prostate cancer, I would tell them to learn how to live with it – Die with your prostate cancer, don’t let prostate cancer kill you. From my reading, you still have 10 years to go if you are stricken with this cancer. Dr. Lim was a cancer expert. He was supposed to know everything about cancer and its treatment. After he had cancer, we do not know what he did to himself. But the truth we all know is that he died one year after diagnosis – a bit too soon. Professor Jonathan Waxman is Professor of Oncology at Imperial College London. He is a clinician who has helped develop new treatments for cancer. In the last chapter of his book, The Elephant in the Room, Professor Waxman wrote about his father – a psychiatrist, who had brain cancer. He consulted Dr. Karol Sikora a well-known cancer expert in London. Professor Waxman wrote: Karol had been asked about treatment for Dad. His advice was that no radiotherapy should be given because Dad’s physical state was so poor that he was unlikely to improve and might worsen with radiation treatment … There would be no way forward except the sour, stumbling path to the grave … My father’s condition deteriorated. His level of consciousness changed, and he sank away from us, falling deeper and deeper into the darkness. Dad went into that dark cave from which there would be no exit. If ever there is one lesson we can learn from the above of Dr. Lim and Professor Waxman, it is this. It does not matter how much you think you know about cancer. Experiences tell me that if you have to battle cancer, rarely would you come out a winner. Professor Stroller is an anthropologist at West Chester University of Pennsylvania, USA. He had lymphoma and had undergone chemotherapy. He came out successful after his treatment. Stoller wrote: Being thrust into a new world that would change my life forever prompted me to think long and hard about my experience among the Songhay people of the Republic of Niger. In time of despair, over and over again, Stoller found comfort in the words and teachings of his long-gone Master, Adamu Jenitongo – a Bushman of primitive Centre Africa. Stoller wrote: If a Songhay develops a serious illness like cancer, he or she is likely to build respect for it. Respect for cancer – or any illness – does not mean that you meekly submit to the ravages of disease. Illness is accepted as an ongoing part of life. When illness appears, it presents one with limitations, but if it is possible to accept the limitations and work within their parameters, one can create a degree of comforts in uncomfortable circumstances. In the same spirit, at CA Care, I often tell patients, Instead of fighting the cancer, learn how to live with it. Perhaps you can live longer by doing that. Living life as a senior, I have learned how to be happy. The key to happiness is to be contented and be grateful for what I am and what I have. Next year I am also going to hit 70, and for what I am today, I remain grateful to God for His wondrous blessing – to me and my whole family. One day, I know I have to go HOME too – be it tomorrow or the next 5, 10 or 20 years. God has that final say. But as long as I am alive, I shall remain relevant and useful for those who need my help. If you are contented and have this strong sense of gratitude you are not compelled to become unethical and greedy in life. You take each day as it comes. Back to Lam’s case, I was trying to impart a similar message to him and to others too. This is my message: Now that you are well for 8 months, be grateful and don’t ask for more. Do you best to sustain and maintain what you have already achieved! I did not expect Lam to do well at all when he first came to see us. And now Lam has regained his health in some ways. Don’t take this blessing for granted or don’t let it slip away. Know this, in the battle against cancer, you will never win! Don’t be complacent! And do you know what is the next impeding danger? Food of course! I often tell patients this: When you are dying and come to see me for help, you will listen and do to what I tell you to do. But the moment you get well, I know you will complain – Oh, the food is terrible. I cannot eat what I like anymore. I am not going to war with anyone on this subject. I have written enough and have said enough about this sore subject of food for cancer patients. Suffice for me to end here by saying: It is your life. You decide what you want to do with it. This entry was posted in Peritoneal Cancer and tagged CA Care Therapy, herbs, peritoneal cancer, pseudomyxoma peritonei by CA Care. Bookmark the permalink.